4Easysoft DAT to MPEG Converter, a professional DAT to MPEG Converter, has the ability to convert DAT to MPEG video with high quality and fast converting speed. Then you can transfer the converted MPEG video to iPad, iPhone, iPod, PSP, etc. for enjoyment. To help you fully enjoy your converted MPEG video, 4Easysoft DAT to MPEG Converter provides you with powerful editing functions to recreate the video, such as trim, crop, merge, effect, watermark, etc. With 4Easysoft DAT to MPEG Converter, you can freely convert DAT to MPEG, DAT to MP4, H.264, etc. Also it has the ability to convert DAT to audio MP3, AAC, AIFF, M4A, etc. With this DAT to MPEG Video Converter, you can choose to convert part video from the source DAT file. Also it helps you merge several video segments into one file for enjoyment. 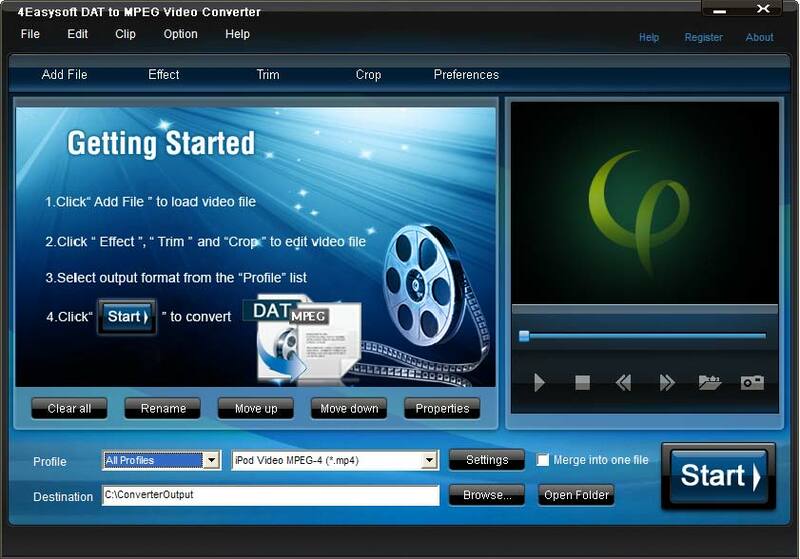 4Easysoft DAT to MPEG Converter allows you to set the video Brightness, Contrast, Saturation. Checking Deinterlacing helps you to convert interlaced video to the progressive video, this function can optimize the video effect. This DAT to MPEG Converter enables you to change the video play screen by removing the black edges and adjusting aspect ratio. Adding text or image watermark in the form of text or image to make the output MPEG video customized. Detailed video and audio parameters are provided with this DAT to MPEG Video Converter like Video Encoder, Resolution, Frame Rate, Video Bitrate, Audio Encoder, Sample Rate, Channels and Audio Bitrate. This DAT to MPEG Video Converter has the intuitive and user-friendly interface, which is convenient for users to convert DAT to MPEG. The built-in player with this DAT to MPEG Converter allows you to preview the source DAT file and converted MPEG video. Meanwhile, you can take snapshot of your favorite scene. With advanced technology and simple steps, 4EAsysoft DAT to MPEG Video Converter helps you convert DAT to MPEG video with super fast speed as well as high quality. Adding watermark to customize the vertical and horizontal location. Output multiple formats at one time conversion for you to choose. Provide subtitle and audio track selection .